Meals On Wheels: What’s The Deal? 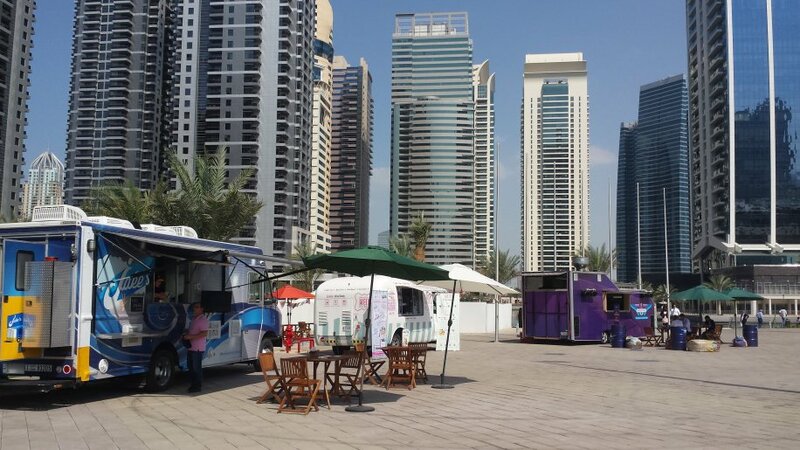 During the Dubai Food Festival which took place in February, around 12 local food trucks rolled from Downtown to Dubai Academic City, catering to the hungry and very-busy Dubai work force. 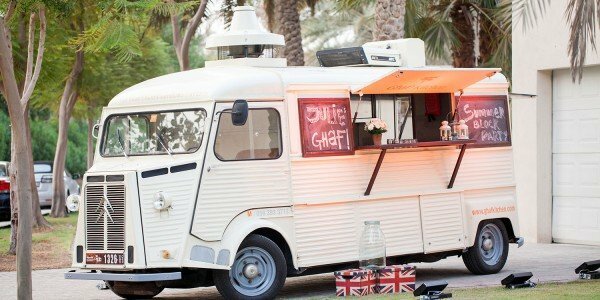 Abu Dhabi also gave street food a push by holding a food festival through which it sent out a caravan trucks, including local brands Salt and Love Donut as well as trucks flown in from the UK, out to Madinat Zayed and Al Ain, ending up on Abu Dhabi’s Corniche. And the trucks kept rolling. 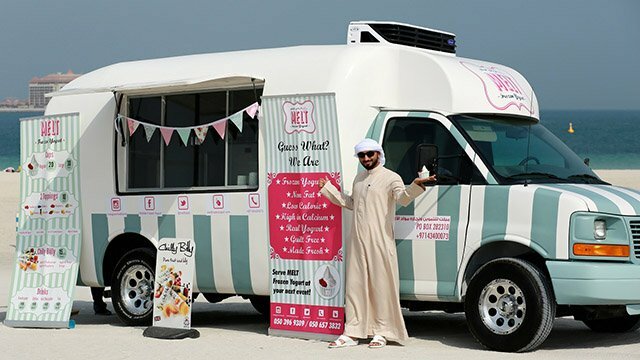 From fast food to sweet treats and gourmet delicacies, the UAE now has a panoply of trucks stationed throughout the city. What drove this rapid expansion? 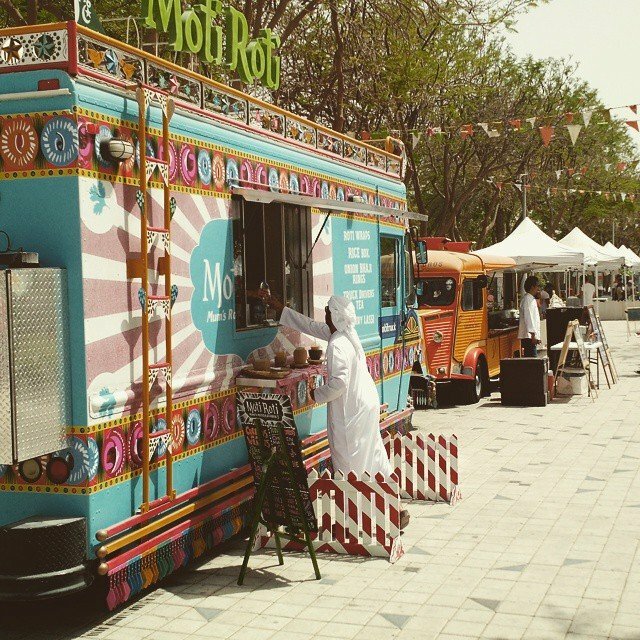 “People got tired of hotels, malls, closed spaces and high-end restaurants, and are looking for a different food culture in different setting,” tells us Tahir Shah, Founder and Managing Director of Moti Roti, Dubai’s Pakistani cuisine food truck. Residents are looking for a new, fast and less costly experience to go with their hectic lifestyle, and they seem to have found that in street food. Also, food trucks are fun! Let’s check them out. 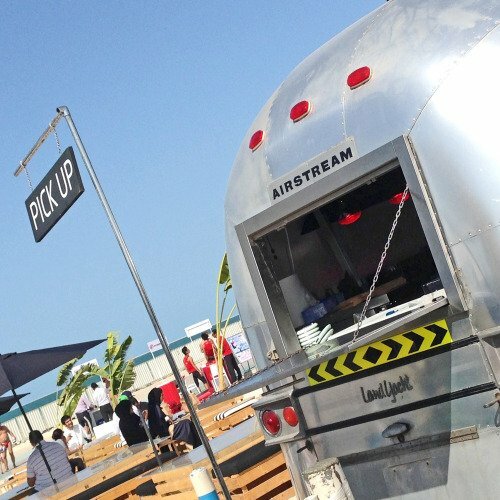 the retro silver burger mobile joint parked at Kite Beach. Among the first food trucks to roll in town, Salt has a minimal menu: burgers –Hook Wagyu beef, Cheese Wagyu beef and Cheetos Chicken- all served as 2 small pieces and available with single, double or triple patties; fries: regular, Cheese and Fire; and sodas, lemonades and shakes. The prices could be lower for such a casual food truck (after all, street food is supposed to be cheaper than diners and restaurants, which doesn’t seem to be the case with the x2 Hooks priced at AED35 and teh x2 Cheetos Chicken at AED40). Despite only having one other table waiting for their food when we visited, our order was a bit slow to come out. But the cute picnic bench area, view of Burj Al Arab and seaside atmosphere made up for that. Follow Salt on Twitter and Instagram: @FindSalt #findsalt for updates on its next moves. surfer who apparently “loves his belly!”. Well, so do we! The truck sporting a gigantic surf wave design moves around from one location to another -The Walk JBR or Um Suqeim Beach where it is parked on most days), keeping you guessing and engaging fans through fun campaigns on social media (#spotjakes which reveals the new location when the truck moves, and #laughwithjakes, funny jokes with puns related to food and ingredients). 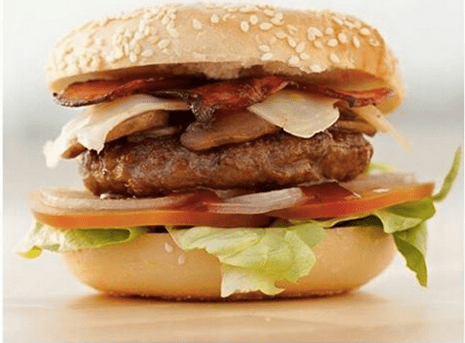 Serving creative bagel burgers, fries and refreshing drinks, the concept has built a cult following, leading its founder to contemplate other street food ideas for a possible expansion. Jake’s is under the mother-company The Food Truck Dubai, which is why it can be found on Instagram and Facebook under: (@)Thefoodtruckdubai. And when you see a “Gone Surfing” sign, that means the truck is on a break or closed! Moving from burger&fries-only to bigger menu options, here are food trucks that boast a “gourmet” status. 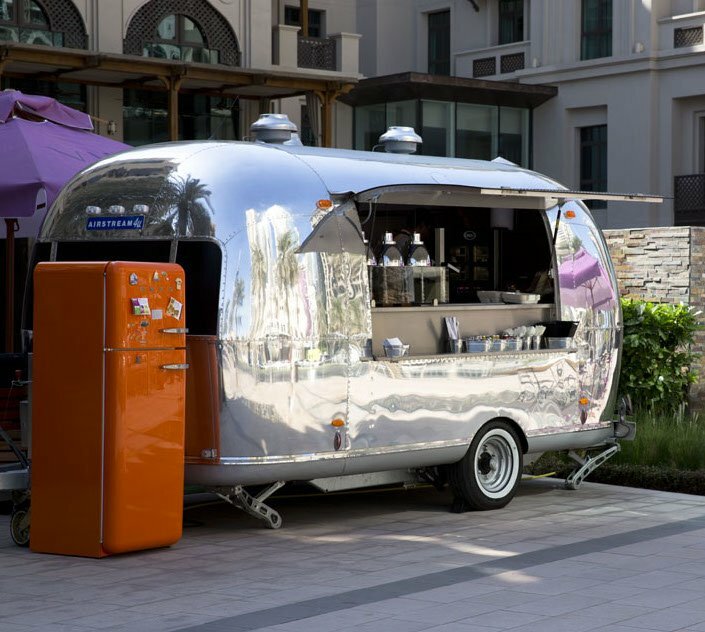 Boulevard’s Qamaredeen District and now having moved to the Square in front of Souq Al Bahar, this restored 1960s Airstream is the first hotel-owned food truck in Dubai. The menu seems to change and when we visited earlier this week, it only listed pulled lamb, caprese salad, sliders and nachos, as well as a couple of desserts (cherry cake, grasshopper..), served to go or to enjoy at the small al fresco seating before the heat becomes unbearable, by a couple of unfriendly cooks and waiters. Prices could stand being a bit lower despite the concept being attached to the Vida name. The portions are good if you’re not looking to leave with an overly extended stomach. We did not visit the truck standing across the street to see if it’s any different. Check it out through @vidadowntown and #vidafoodtruck. Ghaf Kitchen, a 1962 Citroën H van on a serious mission to add a classier touch to some of The Queen’s classics: fish finger sandwiches, prawn cocktail and Eton mess. Dubbed as “the city’s first gourmet restaurant”, the pop-up resto is part of a boutique events and party catering service headed by David O’Brien and spiced up by the culinary talents of Executive Chef Adrian Bandyk. Mostly used for sports events, concerts, festivals, private catering, functions and parties, Ghaf has been spotted around town from time to time in a catch-me-if-you-can context. Find out more about the mouthwatering feasts, canapes, brunch menus and kids menus on www.ghafkitchen.com or on Instagram and Twitter: @ghafkitchen. desserts food truck outside JA Ocean View hotel at JBR. The team behind Melt -a U.S native and her British business partner- has a passion for healthy, tasty sweets, which is why a 100 per cent fruit fare is followed in making the frozen yoghurt and treats. On the menu: refreshing Melt Frozen Yoghurt made of fresh skimmed yoghurt and milk, Chilly Billy fruit ice lollies, Organic Ice Tea made fresh daily. Melt’s mission is to melt away your sweet cravings in a healthy, guilt-free way. 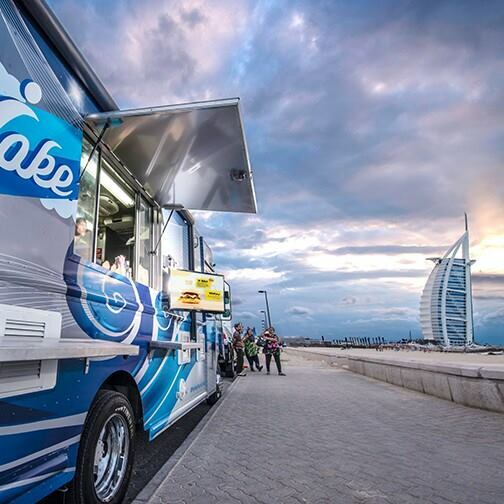 This is one food truck that is sure to be in popular demand during the scorching Dubai summer! 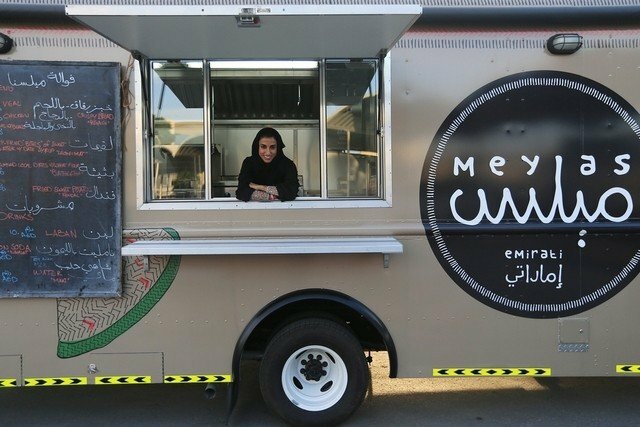 food truck last year, introducing the Emirati culture to Dubai residents through traditional local cuisine, drinks, music and art. Meylas offers Rgag: thin, crispy wrap-like sandwiches filled with chicken, veal or chickpeas & beans, Batheetha -traditional dessert made with date paste, flour and ghee-; fried sweet potatoes called fendal, Khameer which is bread often eaten with cheese and/or honey, Legeimat, sweet fried dumplings drizzled with date syrup, and local beverages such as Lemon Soda Namlet and Tea With Milk. Catch a taste of the Emirates through @meylas. We wish them all well, and being the foodies we are, we’ll be looking out for innovative food concepts!